Although ultraviolet light has several water treatment capabilities, such as reducing chlorine and chloramine, its main use by far is for microbe control. Getting rid of microbial water contaminants can be done with chemicals, like chlorine or chloramines, by very tight filtration, as with ceramic filters, or by disabling the microbes with ultraviolet light. Ultraviolet, UV, is not new. As early as 1877, the germicidal properties of sunlight were known. Landmark events in the development of modern UV treatment include the use of mercury lamps as an artificial germicidal light source (1901), the development of quartz as a UV transmitting medium (1906), and finally the development of the first genuine drinking water application of ultraviolet as a disinfectant in France in 1910. The technology is, therefore, a century old, and it is used world wide. Nevertheless, it is still unknown to many US state and local regulating agencies, who continue to accept chlorination as the only acceptable way to purify water. UV treatment works not by “killing” bacteria, protozoa, and viruses, but by altering their DNA so that they cannot reproduce or infect. If chlorination is like chemical warfare directed at microbes, UV is more like a spaying and neutering program. UV light in the 200 to 300 nanometer (nm) range is the most effective at treating bacteria and viruses. (Visible light falls in the 400-700 nm area.) For most practical UV applications in water treatment today, the light is generated by a mercury vapor lamp, or in a gas mixture that contains mercury. Mercury is the gas of choice because the light it puts out is in the germicidal wavelength range. Lamp output depends on concentration of mercury within the lamp, and the concentration depends on pressure. Low pressure lamps (called LP), the most common, produce UV light primarily at 253.7 nm, an ideal treatment wavelength. Some newer lamps are called “low pressure/high output” (LPHO) and some applications now use mixed vapor lamps called “amalgam” lamps. These require more electrical input and generate more UV output. LPHO lamps are roughly twice as powerful as LP, and amalgams may be about four times as powerful as LP. The standard way to treat unsafe water with UV is to send it though an elongated chamber where it is exposed to the intense light from the mercury lamp. 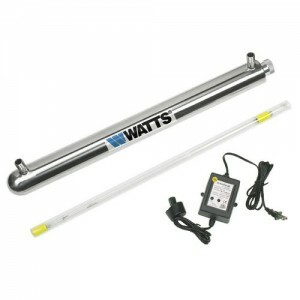 UV bulbs are long and narrow to allow prolonged exposure as the water passes the length of the lamp. The lamp itself is inside a “quartz sleeve,” which protects it from contact with the water, and on the other side of the sleeve there is normally a metal reflective chamber. 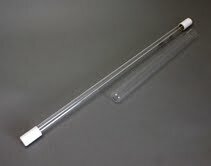 The water enters one end of the chamber, flows past the lamp to exit at the other end, and is in the process exposed for some time and at close proximity to the UV dosage put out by the lamp. UV Lamp, on left, and a quartz sleeve (for a smaller unit). The UV dosage received by the water increases as the flow rate of the water decreases, so a UV unit that puts out a dosage of 16 mJ/cm² while treating water at a flow rate of eleven gallons per minute (gpm) will be rated as 40 mJ/cm² if the flow rate is decreased to 4.5 gpm. Put another way, a UV system rated by its manufacturer to treat water at 40 mJ/cm² at 4.5 gpm will be delivering a dosage of 16 mJ/cm² even if the user exceeds the recommended limit and runs the water at eleven gpm. The tendency now in UV dosage is to follow the “more is better” view we’ve all been indoctrinated in. If ten nuclear bombs will destroy the world, to be safe we need ten thousand. The most common concerns, e Coli, Giardia, and Cryptosporidium, are effectively eliminated at less than seven mJ/cm². The minimum dosage now recommended by NSF, however, is 40 mJ/cm². First, there is the age of the lamp. UV lamps lose strength with time, and almost all manufacturers assume a once-a-year replacement when they design their units. It is a mistake to believe that if the lamp is still burning all is well. UV lamps should be replaced once a year, and when replaced they should still be burning strong. Then there is flow rate. The unit should be sized to provide adequate protection at the highest possible flow rates, but practicality should tell you that in most residential situations, most water is used at a couple of gallons per minute and a great deal of the time—most of the time, in fact—no water at all is being used. Also a factor is general absorption of the UV light for unintended purposes. UV makers usually require that water have less than seven grains per gallon of hardness, less that 0.3 ppm iron, less than 0.05 ppm manganese, and that it be generally clear and free of particulate and tannins. All of these can create situations where the light is absorbed and, therefore, its anti-microbial activity is diminished. Hardness, for example, can form scale on the outside of the quartz sleeve which blocks the passage of light. A related factor is called shadowing. It is primarily caused by particles in the water which can allow microbes to “hide” from the light and not receive adequate UV dosage. The commonly accepted practice in UV treatment is to put a sediment filter of 5 microns or less in front of the treatment chamber to screen out any particles that could allow shadowing. Even if the water looks perfectly clear to the eye, putting a five-micron filter in front of the UV unit is a good idea. The good thing about UV is that in addition to being a very effective treatment for microbes, it is relatively simple and inexpensive to buy and to maintain. It adds no chemicals to the water and leaves no “by-products.” It is very safe, if you follow a couple of simple rules (like don’t stare at a burning UV lamp because it can damage your eyes, and remember that treatment chambers can be hot to the touch). Compared to ozone, chlorine, or even hydrogen peroxide, UV is a very safe home treatment. Also compared with other treatments, UV requires little maintenance. The main disadvantage of UV as germicidal treatment is that it has no residual effect. Bacteria are treated when they pass the lamp, but contamination that occurs downstream of the lamp is not treated. Chlorine, by contrast, stays in the water from the point of treatment to the final point of use and prevents reinfection. The need for a constant supply of electricity can be seen as an additional disadvantage. If the power goes out, you shouldn’t use the water. Above, a very basic UV system. The quartz sleeve, lamp inside, inserts into the stainless treatment chamber. The simple control system provides both visual and audible warning of UV lamp failure. The system comes in 2, 6, 8, and 12 gpm versions. The lamps provide strong UV dosage (30 mj/cm2 at the end of the lamp’s life) that is certified by independent testing (BioVir). Very easy to install, the unit wall mounts with two simple clips.